Elias Caldwell needs more than his life in nineteenth-century England has to offer. He'd rather go on an adventure than spend one more minute at some stuffy party. When his grandfather gives him a pocket watch he claims can transport him to any place and time, Elias doesn't believe it...until he's whisked away to twenty-first-century America. But their love has time limit. Elias's disappearance from the past has had devastating side effects, and now he must choose where he truly belongs—in the Victorian era, or with the boy who took him on an adventure he never dreamed possible? Cute characters. Sweet romance. Fun story with some drama too. I enjoyed it. 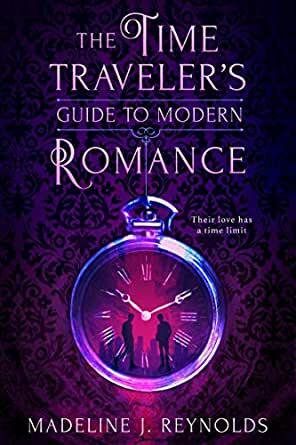 "The Time Traveler's Guide to Modern Romance" is a light, fluffy read that follows Elias Caldwell from the 1800s and Tyler Forrester in the present. After a series of mistakes, Elias's parents are not going to let him attend college- the time he was very much looking forward to- and instead want to send him to a reformatory school. When he goes to his grandfather, his grandfather reveals that he has a special watch which can allow one to travel through space and time (a hand-held Tardis). Elias is skeptical, but gives it a try and ends up in the present. Tyler is an aspiring filmmaker, and is currently filming when a boy appears in front of him. Having seen the remarkable appearance, he believes Elias is from a different time/place and tries to help him while he is there. Their attraction grows very quickly as they spend time together. Although there are some awkward or difficult moments, they find themselves falling in love. However, as Elias learns more about what happened when he left, he finds himself pulled across time and has some difficult choices to make. While this was an, at times, funny, and at other times, sweet story, it moved too quickly, and I did not feel the relationship grow between Elias and Tyler. It felt a bit insta-love which is not uncommon in YA fiction, and I could get there for this couple as they do seem well-suited (and the circumstances probably force a quicker romance due to the amount of time they spend together and the different traditions of the eras). It is also a relatively short book overall, so everything happens pretty quickly- I actually would have liked more in the story and to have it drawn out a bit more. The main thing that lowered my rating was thinking about time travel and how this would go versus the way things play out. I don't want to say too much about the story specifics to avoid spoilers, but this does not seem to follow the general theories about time travel (e.g. not cyclic or linear), and I got caught up in this a bit. I admit, I like to consider time travel and potential consequences in general, so if you don't think about it too much/only surface-level, this probably won't bother you. Overall, I think it's a fun, quick read (don't think too much about the time travel). I loved the inclusion of gay main characters and the comical moments that occur due to being out of time. Please note that I received an ARC from the publisher through netgalley. All opinions are my own. 4.0 out of 5 starsLighthearted adventure! Thanks to NetGalley and Entangled Teen for the opportunity to read and review The Time Traveler’s Guide to Modern Romance by Madeline J. Reynolds! Elias lives with his family in London during the 1800’s and he feels like a constant disappointment to his family. His grandfather shares a secret with Elias because he sees how unhappy he is. The secret is a pocket watch that lets the holder travel through time. Elias accidentally ends up in America in the present time, surprising Tyler while he’s in the school library. Tyler accidentally films everything, as he’s aspiring to become a famous filmmaker. He captures the arrival of Elias, including the small earthquakes that occurred in the library, startling Tyler. The boys become fast friends and Tyler guides Elias around the school and New York City, teaching him current slang and explaining the different inventions Elias has never seen before. The culture and technology differences are entertaining and the story is interesting but light at the same time. 4 stars for a fun, cute read! * I received a complimentary copy of this book for voluntary review consideration and all opinions and thoughts are my own. when elias caldwell appears out of thin air at tyler forrester's prep school library, the explanation for how he got there is completely unbelievable. but tyler saw it happen. and elias is clearly a guy from another time period. and i think that's what makes this so fun. elias and tyler connect as tyler shows elias how things are in the twenty-first century. it's like splash but with cute boys and videos and a pocket watch that lets you time travel instead of mermaids. i loved splash so i'm serious when i'm saying i loved the time traveler's guide to modern romance. elias and tyler are two great characters and one of the best things about their relationship is how knowing each other and learning about one another makes each of them realize things about themselves. and they grow and become better humans. and i love how the story solves for the different time-period paradox. it's a solution that just works beautifully for a problem that at first seems very complex. **the time traveler's guide to modern romance will publish on march 4, 2019. i received an advance reader copy courtesy of netgalley/entangled publishing (entangled teen) in exchange for my honest review. 4.0 out of 5 starsElias and Tyler!